You’ve probably seen it before – either in your own dog, or someone else’s – usually at the dog park or in the backyard and garden. Fido is frolicking happily and then suddenly he stops, sniffs a little and digs, digs, digs before sticking his nose in the newly turned up dirt and taking a nice big bite. If your dog is anything like Bear and has long scruffy fur and a bear, then this also results in clumps of wet dirt dangling and swinging wildly all over the place with each move he makes. But why is your dog eating dirt? And is it a danger to his health? One common reason for dirt eating is speculated to be a dietary inadequacy in your dog’s nutrition. Some veterinarians claim that dogs may resort to eating mud and soil if the dog doesn’t receive adequate amounts of nutrients from the food that is in their food bowls, and because dogs are rather in tune with their own needs, they initiate mud-eating as a way of searching for the nutrients that they are lacking. Oftentimes, they can’t be stopped from doing that routine, which can be frustrating to the owner. But rest easy! So long as your dog is digging around and licking at untreated soil or mud, there’s no need for you to be worries – at least according to most vets. Then, naturally, there is the boredom angle. 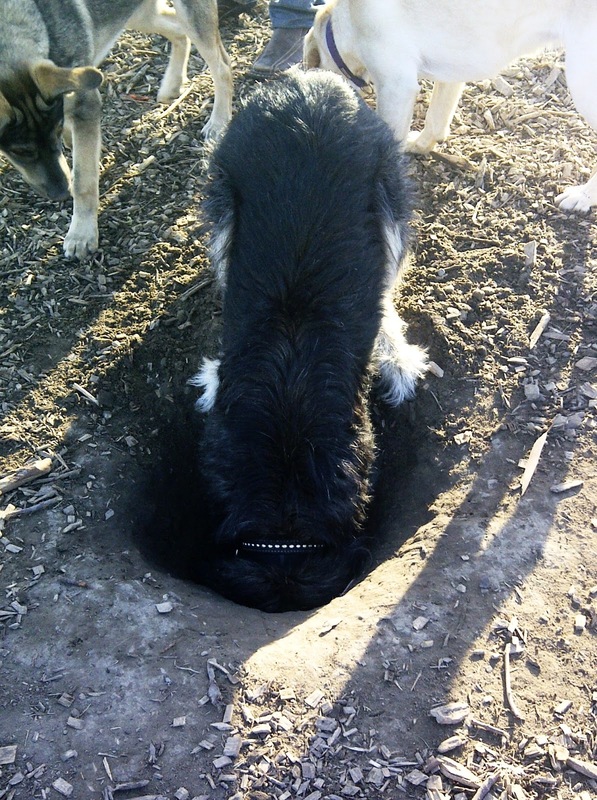 Some dogs will dig out your garden, or create burrows as the park simply because they do not feel stimulated enough. As with most dog behavior, it is up to us (the owners and pet-parents) to figure out what is going on in our pooch’s head. If you notice that the digging mud-eating is happening at a dog park where stimulation abounds, then you may want to look into the details of your dog’s diet – see if there are any vitamins and minerals lacking. However, if your dog is digging only while he’s out in the garden by-himself, then you may need to seriously consider adding some extra walks or play-time into your daily routine. As always, keep an eye on where your dog is digging, and steer clear of lawn and areas that have been treated with chemicals.